Sometimes we moms need to introduce something new and different into our homeschool days. This fall is like that for us, and one of the new things we’re trying is Word Up, a vocabulary program from Compass Classroom. Usually we do not use vocabulary programs, relying instead on enormous amounts of reading to increase our children’s understanding of words, but we were looking for something different and non-bookish. In Word Up we found it. 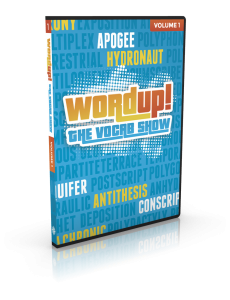 Word Up is a vocabulary program that uses Latin and Greek roots to present about 20 new English words per funny video. In 10-15 colorful minutes a video shows how the two root words (such as the Latin and Greek for ‘earth’ or ‘water’) gave rise to the English words. Half of the words are presented by the Latin expert Dwane Thomas, half by the Greek expert Dwane Thomas, and both of these fellows are introduced by a stuffy suited man, Dwane Thomas. Sounds zany? Well, it is. Dwane Thomas is a funny man and we can’t help but laugh as we watch him. Of course, by bringing humor into learning, he helps us focus and remember. Word Up also provides a wealth of learning resources. For each set of words, you can study online with flashcards, by typing in the words corresponding to definitions, or by spelling the words as you hear them. You can print out the words and their definitions in various formats and study them offline. There are also timed games to test word understanding and spelling. And, finally, you can customize tests to suit your children. I love being able to focus on understanding word meanings with my poor speller and on both the spellings and the meanings with my other daughter. What we have been doing so far is watch the video one day, watch it again a day or two later, print out the vocabulary lists, study them, and write two tests, an easy one first and a few days later a more challenging one. The girls have tried out online aspects of the program as well, and enjoy them. Of course, the bottom line is: do the students learn and remember the new words? We have not been using this program for very long, but so far it seems they do. There’s something empowering in knowing big words and knowing how they are put together. The humor and the videos help a lot, and the tests wrap it all up. I plan to use the games for long term review. Would I recommend WordUp? If your children read widely and often, they will not need it to build vocabulary but might enjoy it for fun. If, however, they do not read a lot, this program will help them by expanding their vocabulary and showing them how words are put together. 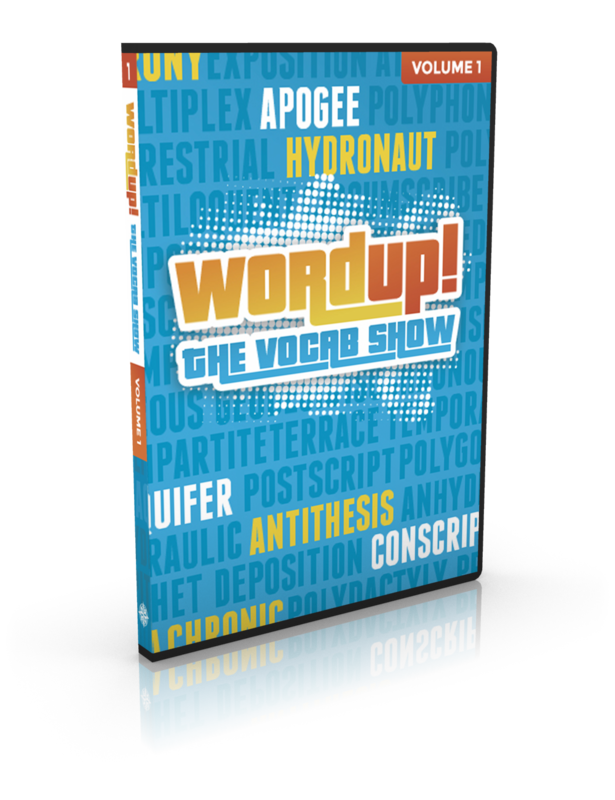 And, if your homeschool needs a bit of inexpensive educational fun, Word Up is a good way to add it. To see if this $15 program would work for your family, you can check out both the video and the online learning component of two free sample lessons. This post is linked to Works for Me Wednesdays, Raising Homemakers, Finishing Strong, and Trivium Tuesdays. Disclosure: We received a free download of WordUp for the purposes of this review. No compensation in involved and I have presented our honest opinion. Posted in: Homeschool, Reviews, Reviews: Curriculum. I love learning the origin of our English words. Thanks for sharing about this resource!